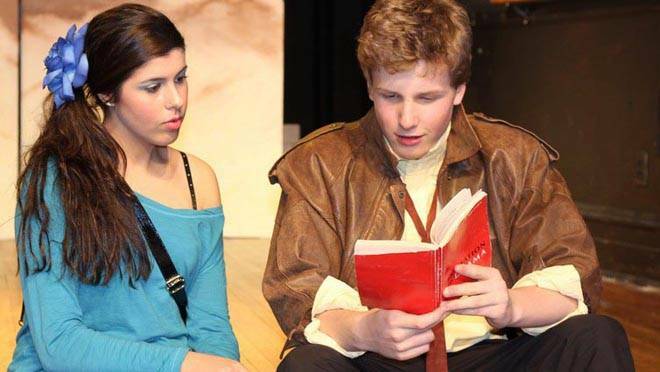 Sacred Heart cast enlivens Fame Jr. Cast members Yasaman Mousavi and Alex Machum rehearse a scene from Fame Jr., opening Thursday at 7:30 p.m. in Sacred Heart School of Halifax. This year, Sacred Heart School of Halifax’s Fame Jr. is sure to be a crowd pleaser. This lively show follows the lives of the budding performing arts students looking to make everyone "remember their names." The show opens on Schlomo (Stephen Deturbide), a young musician faced with the glory of his famous father but determined to branch off on his own. Nick Piazza (Alex Machum) and the lovely Serena Katz (Yasaman Mousavi) both look to change the ideals of typecast actors/actresses and "make magic" onstage. They are brought to order by the teachers Miss Sherman (Marianna Saunders) and Miss Bell (Emilie Barakett). We meet the glamorous, headstrong Carmen Diaz (Jillian Steele), the sophisticated ballerina Iris Kelly (Mattea Roach) and Tyrone Jackson (Peter Issekutz), a budding young dancer with dyslexia. The adage "opposites attract" rings true as the conflicting personalities of Tyrone and Iris seem to draw them closely together. Love is in the air for Nick and Serena, their passion for acting leading to a beautiful rendition of Let’s Play a Love Scene. The connection between Carmen and Schlomo surprises the crowd, and the audience gets a treat in young talent at this point with an astounding performance of There She Goes, with strong vocals and dancing by the vibrant chorus. To break from the students’ dramas, we come to The Teachers’ Argument, where the Arts and Academic Education face off with Miss Bell and Miss Sherman, respectively. The vocals and intention are very well matched, resulting in a powerful performance. The stress of a demanding program affects all the students differently; in the case of young dancer Mabel (Rory Flynn), this manifests itself comically in her need to eat constantly. We see this struggle when she asks for help in Mabel’s Prayer. Carmen feels conflicted and repressed, and she ultimately makes a decision that could affect her entire career. Elsewhere, tempers flare in preparation for the production of Romeo and Juliet. A self-possessed Joe (Max Taylor) is replaced by Nick, who steps in to be Serena’s "new Romeo." We see their relationship blossom. The curtain falls to a reprise of Bring on Tomorrow. The acting is phenomenal throughout, with these talented young performers taking to their well-cast roles. The characters’ chemistry can be felt by all while remaining appropriate for the whole family. Cliff LeJeune (director /choreographer) and Gwen Dawson (director/musical director) faithfully render a breathtaking musical score with energetic dance numbers. The costumes (Denise Flynn) and set (Sharon Bennet) bring the show to life. The show could never have happened without students Elizabeth Dempsey and Gillian Crosby as co-stage managers. The curtain goes up Thursday at 7:30 p.m. in the Sacred Heart Little Theatre, 5820 Spring Garden Rd., and runs each night until Saturday, with a matinee on Saturday at 2 p.m.
Tickets are $10 ($8 students/seniors) or $15 for the dessert gala on Thursday. They may be purchased at the door or by calling 422-4459. Madeline Smillie-Sharp and Alexandra van der Valk are Grade 11 students at Sacred Heart School, Halifax.